Shale gas drilling risks damaging "God's creation", the Church of England in Lancashire has said. A document produced by the Blackburn Diocese said fracking could end up sacrificing the environment for profit. The diocese covers areas of Lancashire which have been identified as having potential sites for the process. 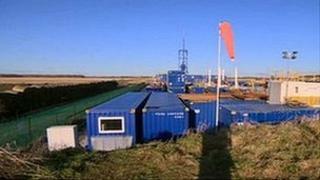 Britain's first fracking was undertaken by Cuadrilla near Blackpool but was suspended after two minor tremors. The process involves using water and chemicals to break up rocks deep underground to release gas. Natural gas extraction "is increasingly presenting people with a choice between economic gain and a healthy environment", the diocese said. The document "Fracking - opportunity or challenge?" sets out the arguments for parishioners over the controversial practice. It said talk of the money to be made "has lured landowners to sign or contemplate signing leases to drill on their land". "A relatively new technique to extract natural gas from previously unreachable depths is prompting a rush to drill, despite virtually no history as to its environmental impact," the document added. "Any consideration of the pros and cons of an issue like 'fracking' has to be viewed in the context of global climate change, which itself cannot be ignored by Christians, as it raises questions of justice, fairness, provision, stewardship and love for God, his creation and his creatures, including our global human neighbours." The document went on: "The time we spend thinking, praying and acting now to protect our drinking water, and the rest of God's glorious creation cannot compare with the time succeeding generations could potentially spend trying to make good what will likely happen if we in the church remain uninformed and silent." It added: "On a more localised basis, gas companies claim that drilling brings economic benefits, including increased employment. "This premise is alluring to many landowners, including local farmers who may be struggling to make their land profitable. It has lured landowners to sign or contemplate signing leases to drill on their land. "This is one way they can retain their land and make money, and money in today's world seems to count for more than environmental stability." Cuadrilla has said there are no proven environmental risks from the process. A government review has said the process is safe if adequately monitored.